How appropriate it is to celebrate the Feast of the Body and Blood of Christ with the opening of the Summer season when all the beauties of nature are in full bloom! For, as the Summer is the blooming season of the year, through the Body and Blood of Christ, we too are called to bloom. Some of you may be asking yourselves, “What is our priest talking about?” Allow me to explain. First of all, what is the purpose of the Feast of the Body and Blood of Christ? This special Feast is celebrated in remembrance of Jesus who gave His life for the salvation of many. It is a Feast in remembrance of Jesus’ command to celebrate the Sacrament of the Holy Eucharist. As we heard during today’s Gospel Reading, “While they were eating, Jesus took a loaf of bread, and after blessing it he broke it, gave it to them, and said, ‘Take; this is my body. '” [Mt. 26:26: Mk. 14:22; Lk. 22:20; 1 Cor. 11:24] “Then he took a cup, and after giving thanks he gave it to them, and all of them drank from it. He said to them, ‘This is my blood of the covenant, which is poured out for many for the forgiveness of sins. '” [Mt. 26:28; Mk. 14:24; Lk. 22:19; 1 Cor. 11:25] Jesus commanded us to celebrate the Sacrament of the Holy Eucharist, to eat His Body and to drink His Blood. When Jesus used the words, “Very truly,” such not being on too many occasions, He was pointing out to something that was extremely important, something that must not be overlooked. In the last Bible passage that I read, Jesus was indicating that we must receive the Sacrament of Baptism in order to qualify for the Kingdom of God. Through the Sacrament of Baptism, we receive our new creation as the first installment towards salvation and eternal life in the Kingdom of God. Through the Sacrament of Baptism, we received the forgiveness of the original sin and our sins that were committed prior to being baptized. At that moment, we became members of the Body of Christ. Through our free will, we were free to welcome Jesus in our lives in humility, obedience and servitude. We could have rejected God as the fallen angels have done. Once we have received the Sacrament of Baptism through faith in Christ, we are called to maintain our state of grace at all time. How do we do that? It is by receiving the Sacrament of Confession! Then, being in a state of grace, we are called to receive the Sacrament of the Holy Eucharist, the Body and Blood of Christ. Believe me, unless we receive the Body and Blood of Christ through the Sacrament of the Holy Eucharist, we are not saved! We may have become a new creation by dying with Christ, being buried with Christ and having resurrected with Christ, but the soul has no life in it without the Body and Blood of Christ. Faith alone does not save anyone! The Sacrament of Baptism alone does not save anyone! The Sacrament of Confession alone does not save anyone! Nor does the Sacrament of the Holy Eucharist alone save anyone! Each of the aforementioned are required in the proper order for us to be saved and qualify to enjoy eternal life in the Kingdom of God. “From those who have nothing, even what they have will be taken away.” What a powerful statement! How can you take away something from someone when he has nothing? From those who refuse to shine in the love and the light of Christ by the grace of God the Father and the power of the Holy Spirit, God’s gift of the new creation that was received during the Sacrament of Baptism will be taken away. That person, without the Sacraments of Confession and the Holy Eucharist, is as good as dead! He will not qualify as a son or daughter of God to enjoy the eternal beatific vision of God in the Heavenly Kingdom. When Christ anointed us by putting His seal on us, giving us the gift of the Holy Spirit in our hearts during the Sacrament of Baptism, that was the first instalment [2 Cor. 1:22] towards our salvation. If we do not walk our living faith in Christ and receive the Living Bread of life on a regular basis, by failing to obey the teachings of Jesus, we will not receive our final instalment. It is as simple as that! The Sacrament of the Holy Eucharist is the Body and Blood of Christ. The gift of salvation and eternal life in the Kingdom of God comes from Christ and no one else. If Jesus is not good enough for us, we refusing to receive Him in the Sacrament of the Holy Eucharist, what living hope do we have of receiving our salvation and inheritance in the eternal Kingdom of God? None! Without the Body and Blood of Christ, we are lost forever! Through Moses, the people of the Old Testament were given the Old Covenant of the Law. Through the blood of the sacrifice of animals, they received the forgiveness of sins. These sacrifices were imperfect because they had to be repeated over and over. Now, through the New Covenant of grace that was implemented through Christ, the perfect sacrifice of the Body and Blood for the forgiveness of sins, we receive the salvation that the Heavenly Father promised to our forefathers in the Old Testament. As children of God, [1 Jn. 3:1], having died with Christ on the cross, having been buried with Him and having resurrected with Him, we have become new creations. Having become new creations, we must behave as new creations, as slaves of Christ who shine in love. “Do you suppose that it is for nothing that the Scripture says, ‘God yearns jealously for the spirit that he has made to dwell in us? '” [Jas. 4:4-5] Yes, God is jealous of the spirit that He has made to dwell in us. Through Christ, we have become living Temple of the Lord God. As new creations, we are as blooming flowers, called to shine in the darkness of this world so the Spirit of Christ may manifest Himself through us. Having the light of Christ within us, it is not called to be hidden. It is called to shine forth through our thoughts, our words and our actions. It is called to be a living example. Through the Sacrament of the Holy Eucharist, the Body and Blood of Christ, we can receive our blessed hope, the assurance of our salvation. Through the Body and Blood of Christ, we find the necessary strength to persevere in this world. While we are in this world, we no longer belong to this world! As we participate the Holy Mass, let us be thankful to the Lord Jesus for His Body and Blood that assures us our salvation. 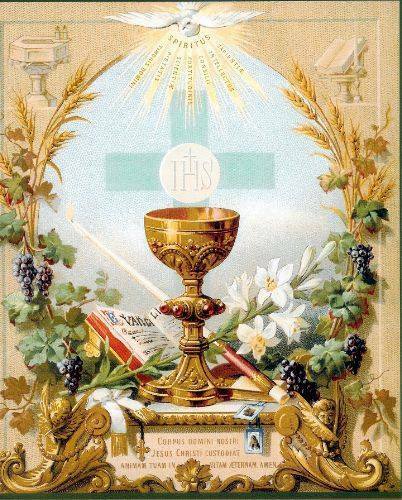 And let us remember throughout the week that as new creations, we are called to feed on the Sacrament of the Holy Eucharist so the Body and Blood of Christ may transform us in His likeness.